In the year gone by, Sri Lanka has moved towards greater democratisation and reconciliation. The pace may not be to everyone’s satisfaction; much remains to be done – and undone; but the overall direction cannot be in doubt. Economically the government has veered sharply from its initial promises. It is bereft of a clear vision or a strategy, teetering from one mistake to the next and increasingly willing to borrow from the Rajapaksa economic copybook. A critical lesson of 2016 is that the wrong kind of economics can undermine the right kind of politics, and make even advanced democracies vulnerable to the siren song of racism, bigotry and xenophobia, an old lesson which each generation prefers to learn the hard way. The Brexit disaster and the rise of Donald Trump are warnings of what might await Sri Lanka if the government fails to right its economic path, in time. Governance today is better than governance under the Rajapaksas, but given how bad things were, that is not saying anything very much. Every time President Sirisena soliloquies about good governance while favouring the likes of the pistol-toting former mayor of Hambantota, every time PM Wickremesinghe perorates about good governance while trying to impose more economic burdens on the masses, they are reducing the distance between themselves and the Rajapaksas. Sirisena-Wickremesinghe administration’s VAT imbroglio is symbolic both of what is right and what is wrong in today’s Sri Lanka. It is also an indication that what is right about Sri Lanka – its greater democratisation – might succeed in alleviating the worst of its economic wrongs. Had the Rajapaksas been in power, the VAT increase would have gone through, just as the previous hikes in indirect taxes were carried out with nary a negative word. The traders would not have protested, the courts would not have intervened and government ministers and parliamentarians would not have made their objections known. Some UNP minister called the VAT proposal a Rajapaksa tax. They were right, though not in the way they intended. The VAT hike is the clearest indication that the new government does not intend to carve out an economic path of its own but plans to amble down the Rajapaksa way. The Rajapaksas followed a strategy of taxing-borrowing-and-spending, albeit with a difference. Rajapaksa taxing was of the indirect variety, targeting essential goods and services, placing a disproportionate share of the burden not on the rich but on those clinging to the bottom half of the income-totem pole. Rajapaksa spending was mostly military-related or on physical infrastructure projects with little forward or backward linkages and extremely limited employment and income generation. The high growth rates of the Rajapaksa years acted as a facade for an economy which was structurally weak and dangerously flawed. These included the mushrooming of debt, growing economic inequality, high levels of youth unemployment (20.1% in 2014) and the absence of quality jobs (most job creation was in the informal sector). Though Sri Lanka continue to have a high human development index, the value dropped significantly when adjusted to inequality – from 0.757 to 0.669 in 2014 (a loss of 11.6%, which stemmed mainly from inequalities in income and education levels). Of the employed, 20.4% constituted working poor while vulnerable employment was as high as 43.1%. Sri Lanka also ranked as a country with serious risk of hunger, even in 2014, according to the World Hunger Index. These were not abstract problems, but politico-electoral time bombs. The Rajapaksas thought they could neutralise these problems with glitzy propaganda-hypes and daily doses of minority-phobia. They were wrong. As the Top Line Survey by the CPA revealed, by December 2014, cost of living was the number one problem affecting the electorate, a prioritisation which cut across ethno-religious lines and administrative boundaries. The Sirisena-Wickremesinghe administration won two elections promising to tread a different economic path. Increasingly that promise is being honoured in the breach. Not only does the government continue to spend lavishly on political elites (members of the Rajapaksa-led Joint Opposition have no hesitation in enjoying this largesse); it also displays a disconcerting inability to imagine a different developmental model and a tendency to impose more and more financial burdens on ordinary people. During his Uganda tour of May 2016, the then president Mahinda Rajapaksa was reportedly enchanted by the servile conduct of the Ugandans he came into contact with. According to the political column of the Rivira of May 12th 2013, Mr. Rajapaksa asked his Ugandan counterpart, “When we look at them (Ugandans) it is clear that they have a very obedient nature. How did you manage to make them so obedient?” President Musevini’s response was that this servility was a relic of the Colonial ethos, when White Masters kept their Black and Brown Subjects in total subjugation. Rejected by the not-so-servile Lankan citizens twice, Mr. Rajapaksa might be thinking back to that incident with a good deal of nostalgia. But the incident is of relevance to Lankan’s current government as well. The much-postponed local government elections will have to be held sooner or later. If the government is serious about bringing in a new constitution, it must be ready to face and win a referendum. Both a new constitution and a political solution to the ethnic problem would require public approval in a referendum. And winning a referendum would be impossible, if the people, especially the Sinhala majority, are not relieved of their economic burdens. If the government wants to implement the rest of its political agenda, an economic policy of rice-and-curry now – rather than one of Jam Tomorrow – is a necessary precondition. Even more than the UNP, President Sirisena and his SLFP cannot afford to antagonise the electorate. The President is particularly vulnerable, since any new political party by Mahinda Rajapaksa will be a direct threat to him and to the SLFP. 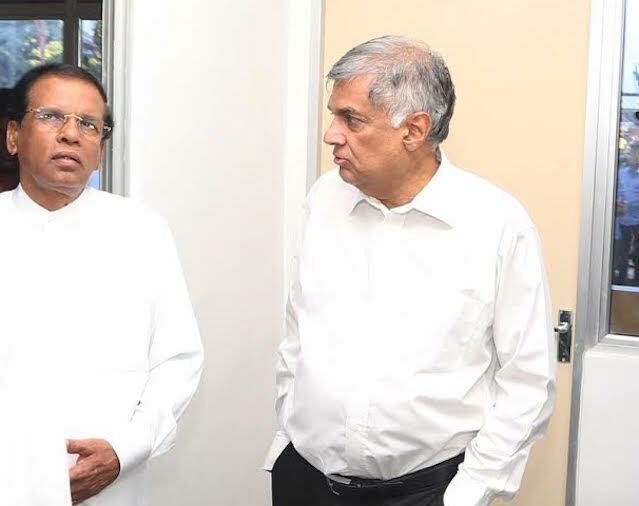 If the government he heads continue to impose burdens on the electorate, Mr. Sirisena’s SLFP might slip to the third place in any future election, local, regional or national. If the Sirisena-Wickremesinghe administration does not cease straying into Rajapaksa territory economically, it will undermine its past political gains, its future political plans, its own political existence and peace and stability of Sri Lanka. The Rajapaksas lived in their very own make-believe world. In that imaginary world, Sri Lanka was a rapidly developing land – its debt burden was not spiralling out of control; its poor were not been deprived of their homes and livelihoods; its environment was not been degraded; its health and education systems were in mint condition. In the end, they didn’t succeed in hoodwinking the electorate; just themselves. In governance, speed is a virtue, only if the path is the right one. Non-democracies might move faster than democracies, but more often than not the movement is in an erroneous direction. The VAT disaster was averted because Sri Lanka now has such democratic basics as the right to protest and a non-cowed judiciary act. Hopefully, the reinstated checks and balances will act antidotes to the disastrous economic path of the Sirisena-Wickremesinghe administration and prevent it from hurling itself and the country down the precipice of a Rajapaksa return.